A short article on collecting herbs and grasses for sacred ceremonies, Mic Mac style. I have been a child of nature since about the time I could express wonder at all that it (nature) could offer . As a natural healer I have enjoyed using herbs successfully in my healing practice, and would like to share a few of these with you. I am able walk through the woods of the East Coast and find medicinal herbs to use for remedy s in tinctures and teas. I am able to do this because I have been fortunate to have had some good teachers to show me how. I want to honor these teachers and their teachings in the space that I have been given within this article. My great Aunt Helen was a famous naturalist, residing at her animal sanctuary by the salt marsh in Maine. Aunt Helen would take me into the woods by the tidal waters at eight years old and show me the plants, birds , and animals, that she loved so much. This experience instilled in me the same love for nature, that she held so dearly within herself. My first lesson was about “Sweet Grass” and how to spot it growing in the tidal marsh. At eight years, I wanted to know if you could eat it? My Aunt looked at me with dismay thinking that this one would be hard to teach. She patiently explained to me that I was related to a tribe of “Indians’ from the Miramich river area in what is now New Brunswick. Then she added that the Mic Maqs used Sweet Grass for making baskets and braiding. She explained that when dried and burned it would provide a cleansing for the person that needed it. Sweet grass has a high spiritual purpose for cleansing of the aura and clearing away negative vibrations from the energy field of a health seeker or in a dwelling. I guess I must have learned something because fifty years later I found myself collecting sweet grass with my sister by the side of the beautiful Miramich river in New Brunswick, Canada . To pick Sweet grass you must first offer a little tobacco (or corn meal) to the spirit of the plant so that it will make itself visible to you for collection. There are grasses that look similar that will cut your hands when picking them . Sweet grass pulls up by the roots easily and grows next to grasses with stronger roots for protection from the wind and snow. Carefully clean the rootlets of dirt and then hang the bunches upside down for a few days. Then tie the root ends with another strand of sweet grass, ( be careful not to pull off the roots at this point). Tightly braid three strands of grass together. This is all done with reverence for the “spirit of the plant” with which you are working with. Within several days the braids will dry and they can be used in healing ceremonies and the tips make a delicious tea. In the Southern parts of the United States sweet grass grows along the coastline of South Carolina and Georgia . It is here that the Gullah people use it to make their beautiful baskets. Sage can be used in a similar manner, and grows in other parts of the country , especially, in California it is used to clear and purify the energy field in much the same way as the Sweet grass. Both of these plants are used in healing ceremonies with full awareness by the healer, shaman, or medicine man, as to its intent and purpose. My aunt Helen had a small book published, on her behalf and authored by her on the herbs found in New England forests. She was my first teacher and I am grateful for the things I learned from her. Albert Ward , Mic Maq medicine man, healer, and teacher is another of those who can pass on great teachings with a few words. Albert told me one day that he talks with the plant spirits who tell him what their purpose for healing are. Albert and I have searched for healing herbs from North Carolina to Canada together, and three herbs that stand out for this article are Ginseng , Golden Thread with an honorary mention about the Ash tree fungus. American Ginseng, a popular herb, grows mostly at or above three thousand feet and on the north sides of mountain and hills, the best time to collect it is in the fall because of the visibility of its red berries the leaves yellow in the fall and are similar to other plants that grow nearby . Ginseng hides itself well and if you are first time “Sang” hunter you may return home empty handed. For example, one time I bought and planted cultivated Ginseng plants in the mountains of West Virginia, and when I returned 3 years later I could not find a single plant . It seems that for me when I need to make some ginseng tea for balancing my immune system I am led right to it. Another example, is when Grandfather Albert was looking for ginseng that he needed for his own personal health. He asked me to show him where to find it in the Western North Carolina mountains, being a seasoned “Sang hunter” by that time I was honored to lead him to where I knew it grew. On the trail I had stepped over several plants, when he called to me and pointed out the plants that I had walked over were Ginseng plants, I was really embarrassed about missing them .Albert and I had a good laugh over that one. It seems that Ginseng finds you when you are ready for it. On another note I did find some of the sacred Ash fungus growing in the same area. This fungus grows up high on the side of the tree where you can break it off and burn it to ward off the negative spirits. It is used much like Sweet Grass and Sage. Please obey all local laws regarding the harvesting of Ginseng. You may need a note of permission from the landholder in some cases. If you should be lucky enough to find a plant drop the berries back into the hole that was vacated by the root and cover them with dirt. Then offer the plant spirit some tobacco. One of my favorite herbal healing plants is “ Gold Thread”, it is used as a spring tonic and can purify the blood giving the user greater energy. It grows in clusters with the roots running underground that look like gold threads, the leaves look a little like strawberry leaves and it is found growing from North Carolina to Canada. I had a little trouble finding it and my Mic Maq Medicine friend helped me locate it near by the Miramichi river on a nearby indian reservation. It is usually wise to make an offering of tobacco or cornmeal and leave the “grandfather plant” in the ground as is the case with the Ginseng. A few of the threads are boiled as a tea that energizes the body. Albert ward was the first to introduce me to the Gold thread and the Ash fungus and their uses. “Howard” a Seneca native from New York taught aura cleansing, with hawk feathers, river rocks, crystals and herbs. Howard used the feathers to “sweep” the aura” down one side of the body and up the other. He burned white sage, white cedar, and sweet grass to clear the auras of his students. Everything he did was in perfect order and I have used his ceremonies in special situations where other methods did not work. I have used the small cedar pine cones as a native remedy for prostrate cancer for male clients. This remedy is made into a tea also. These are a few of the “American aborigine” herbal medicinals that are used for natural healing remedies and in ceremonies. Ceremonies are a little different with each tribe and some herbs are not available in some places . To reiterate, I am eternally grateful to my teachers who have taught me the “ Native ways”. Until later “All My Relations” White Wolf. 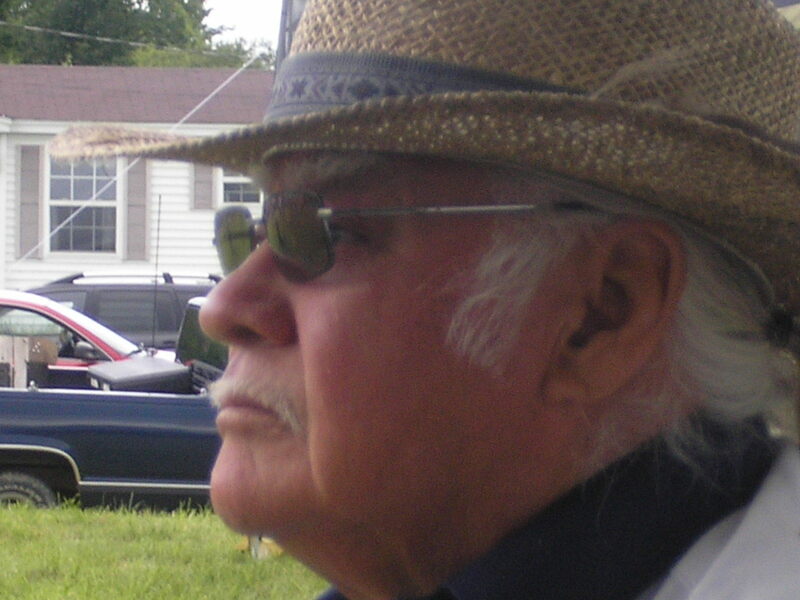 Picture of Grandfather Albert at 2007 Red Bank "Pow Wow".